The Ostroy Report: Daniels Out. Time for Scarborough? "Scarborough's been smartly playing the moderate card lately, which is not what we can say for some of the other 2012 "front-runners" like Palin, Newt Gingrich and Mike Huckabee. These guys are so fringe in their ideology that they could never appeal to the all-important middle." Those words ring even truer today as the pack of Republican hopefuls still primarily comprises either the most radical group of Tea Baggin' loons like Gingrich, Palin, and Michelle Bachmann or snoozers like Tim Pawlenty. Mike Huckabee, Donald Trump and Mitch Daniels are out of the race, leaving the supposed front-runner status to Mitt Romney. But he has several major obstacles to overcome, including his Mormon faith, his own ObamaCare-like program while Massachusetts governor, and the fact that he's already lost once before. And while the GOP is desperate to have "attractive" candidates like New Jersey Gov. Chris Christie or former Utah Gov. Jon Huntsmann Jr. run, the ground clearly remains quite fertile for an outsider like Scarborough to toss his fleece into the ring. The word on the street is that Huntsmann's the GOP's best bet. Also a Mormon, he was appointed by Obama and served as U.S. Ambassador to China from 2009 to April of this year. He's a fiscal conservative who backed Obama's economic stimulus, and has moderate views on civil unions, immigration and the environment. But the mountain he has to climb is quite steep. He has zero name recognition, lacks major charisma, worked for Obama and is seen by many in the party as too "liberal." As the Conservative Daily News wrote, "What did Jon Huntsman, Jr. forget, you ask? Simple, he forgot conservatism. Huntsman has mastered the art of pandering to his inner liberal. He maintains a sterling record in fiscal matters but has a nasty habit of straying from conservative principles." 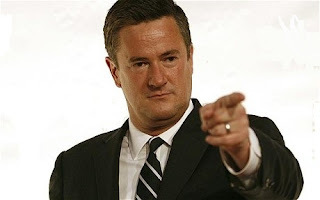 This tepid support from the right to the current GOP pack should convince Scarborough that the party faithful is waiting for a skilled politician with personality and name-recognition to enter the race. Someone who is centrist enough to attract independents without offending the base, and tough enough to face an incumbent president whose popularity is growing.